Thyroid cancer is a rare cancer, around 2,700 people are diagnosed with cancer in the UK each year. Less than 1 in every 100 cancers diagnosed in the UK is a thyroid cancer. It is 2 to 3 times more common in women than in men. 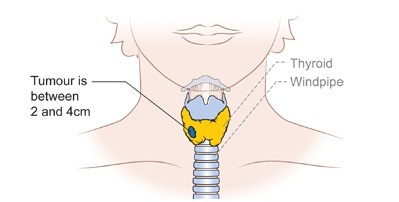 Papillary thyroid cancer is the most common type . About 6 out of 10 thyroid cancers diagnosed are papillary (60%). This type is more common in women. It is usually diagnosed in younger people and is usually slow growing. Follicular thyroid cancer is most often diagnosed in middle aged people. About 3 out of every 20 thyroid cancers diagnosed are this type (15%). 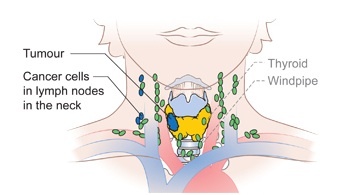 Medullary thyroid cancer is a rare type of thyroid cancer. Between 5 and 8 out of every 100 thyroid cancers diagnosed are this type (5 to 8%). Anaplastic thyroid cancer forms less than 1 in 20 of all thyroid cancers diagnosed (5%). It is usually diagnosed in older people. A lump at the base of your neck. A hoarseness of voice that lasts for more than a few weeks. A difficulty in swallowing that does not get better. 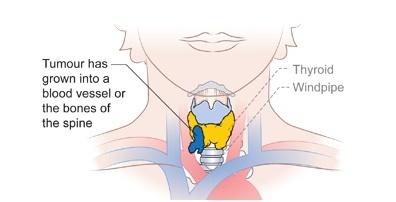 The tumor is entirely inside the thyroid and is less than 1cm across in any direction. 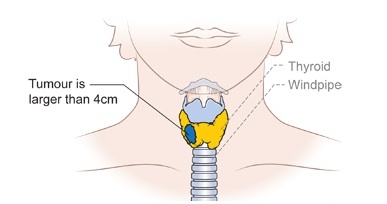 The tumor is entirely inside the thyroid and is more than 1 cm but no more than 2cm across in any direction. 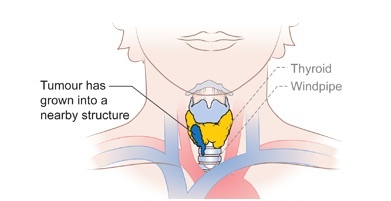 The cancer has grown outside the covering of the thyroid gland into nearby soft tissue, such as the voice box (larynx), windpipe (trachea), food pipe (oesophagus) or the voice box nerve (recurrent laryngeal nerve). The cancer has grown outside the thyroid gland in the area surrounding the bones of the spine, or one of the main blood vessels in the neck area. 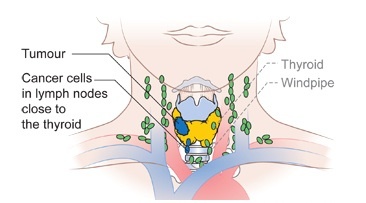 Means the cancer has spread to other lymph nodes in the neck (called cervical nodes) or to lymph nodes behind the throat or in the upper chest . 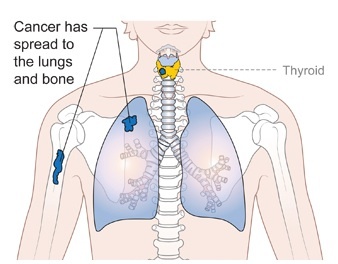 Two possible stages of cancer spread, either the cancer has not spread to another part of the body or it has spread.